Muscles get damaged during training and begin to break down in a process known as catabolism. This can cause severe soreness and a loss of muscle mass when not properly treated. Finish Line™ combats catabolism with 6,000mg of BCAA’s to flip your “anabolic switch” via the mTOR pathway, enabling your body to increase both its rate and capacity for protein synthesis. Quickly and easily reverse the negative aspects of catabolism with Finish Line™ and your body’s enhanced anabolism! Beta Alanine is THE biggest advancement in athletic enhancement since creatine. It has undergone years of intense clinical study and the truth is it WORKS. Beta Alanine can enhance athletic ability by increasing endurance, stamina, and time to exhaustion. Beta Alanine works by converting to Carnosine, which builds up over time. Carnosine enhances endurance by eliminating high levels of acids (such as Lactic Acid) from our muscles when we train. This means reducing the “burn” from high repetition sets or exhaustive endurance training, allowing you to train harder and longer! 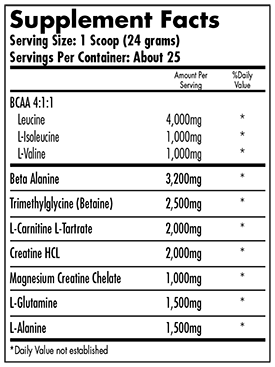 Finish Line™ includes the clinically proven dose of Beta Alanine in every serving, a whopping 3,200mg! When it comes to getting bigger and stronger, nothing comes close to good old Creatine. Most products use outdated and inferior forms of Creatine, while simultaneously not dosing it high enough to actually work! Finish Line™ replaces the need for any other Creatine product by utilizing the two most effective forms of Creatine (Creatine HCL & Magnesium Creatine Chelate) at the clinically proven dosage of 3,000mg/day. One serving of Finish Line™ provides all the incredible benefits that Creatine has to offer: increased strength, power, explosiveness, and energy in the gym! Most dietary supplement ingredients have a single benefit. Some really unique ingredients have two benefits. Then, there is Betaine. Clinical studies have shown that when dosed properly (2,500mg/day, as found in 1 serving of Finish Line™), Betaine can increase strength & power, simultaneously burn fat while building muscle, support heart health, increase running capacity, and increase muscular endurance! A recent study at the University of Connecticut showed athletes taking the recommended dosage increased muscle strength by 25% and muscle power by 20%. Imagine what these increases could mean for your next training session! Another study at Coastal Carolina University, bodybuilders who consumed the same amount of Betaine showed that they were able to lose body fat while increasing their lean muscle mass at the same time! Finish Line™ can propel your training to the next level, including EVERYTHING an athlete needs to excel, key ingredients at clinically proven doses. Don't settle for products which hide these crucial ingredients in proprietary blends and let IFN help you reach the Finish Line™ faster!